Tell Your State Legislator to Support Gov. 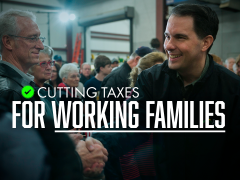 Walker’s Budget! Contributions are not tax deductible for federal income purposes. Corporate contributions are prohibited by law. State law requires the collection & reporting of the occupation of each individual whose contributions exceed $200 per election cycle.